Dave Dana, a member of the Society, contacted us in April with this message. 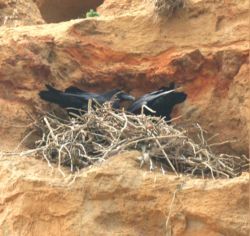 “Some members will already be aware of the Ravens’ nest at Lake cliffs. Although you can only look up to the nest, you can still see the comings and goings of the adults but you can’t see the nestling(s) yet. Yesterday (Friday 13th April) both adults were away from the nest for about 40 minutes, suggesting that the chick(s) now need both parents to feed them. The site is inaccessible and the welfare of the pair and their chicks appears to be assured, so we thought it might be of interest to local residents and visitors.